I didn’t know this was possible. 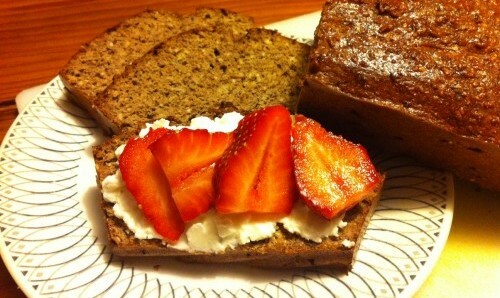 But this high protein low carb 180 chocolate bread is simply divine! Guilt free and gluten free, with the only thing needed is 15 minutes of your time and the ingredients to put this together. 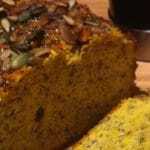 This loaf makes for the perfect snack or dessert giving you a small slice of heaven. Mix the 180 Natural Chocolate Protein Superfood and the hazelnut meal into a bowl. Add the mashed banana and egg yolks along with the mineral water. Mix thoroughly. Beat the egg whites until stiff then fold them into the mixture. Pour into a loaf tin. Bake at 180° for about 25 min or until cooked. No longer though as it will get a little dry if over cooked. To serve you could put cottage cheese and strawberries on it or mashed banana and cinnamon. Play and have fun with the toppings because this is seriously delicious guilt free chocolate… Yum!! Would almond meal work for hazelnut? Yes almond meal will work too. It will probably be a little less prone to drying out with almonds too and should be just as delicious. It’s the first bread I’ve made that my daughter loves to eat! When it says mineral water in the recipe do you mean sparkling mineral water or just plain water? Yep I made it with almond meal, and it tasted a little dry when it was still hot from the oven, but the next day after sealing it in a container in the fridge it soaked up a bit more moisture and is really nice… YUM. Great recipe. I’m going to experiment next time with adding a little coconut oil as well, for added moistness. Thanks! Oh my gosh…..this was so amazing!!!! Sooo hard to stop at just one piece!! !